Winter is a wonderland. Yes it is of course cold, and dark at times, but full of promise and adventure. 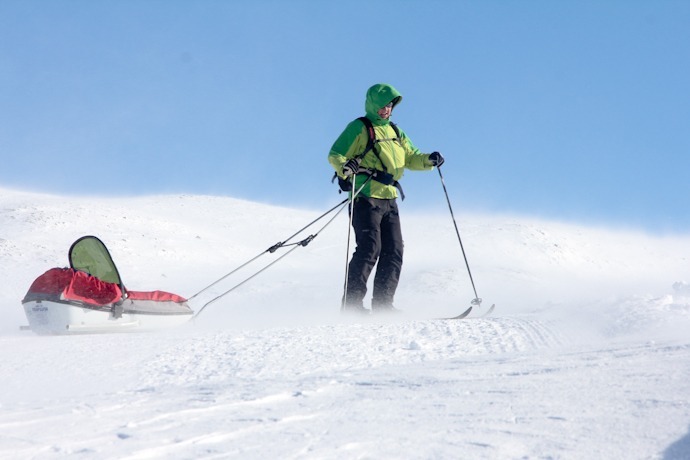 For the little one, adventure starts early, as tradition in Norway, we got a pulk, a sledge you pull on skis, and in the pulk, goes the little one, a chariot to enjoy the winter passing by. From late November, its possible to get up on the fjell (mountainous plateau), just up the hill from Øyer, this winter early conditions were excellent and warm enough to enjoy being back on skis. One great thing about Norway at Christmas, is that you simply walk into the forest, cut your own tree down and bring it home. Local friends invited us to do just that, we dragged the kids into the whole adventure, and enjoyed Christmas rice porridge afterwards to get us into the festive spirit. The following morning, our little one, examined the new lounge furniture with amazement, and the whole festive season went well, with only a few of the tree decorations being removed, inspected and of course chewed! Another great thing, about this past Christmas, I tried out snowboarding again and great news, my broken knee now works. February last year I also tried, but it did not feel right, so a programme of lots of biking last year, and hey, I am back in the game. I mean its not so prefect that I do not feel any pain, its that I can enjoy the slopes again, which is cool enough for me. The funny thing is though, is that I am likely to start alpine skiing at some point soon, may be next winter… On our door step is Hafjell, (a great bike park in the summer), and near by is Kvitfjell, a bigger hill, that has an annual Mens World Cup Downhill, plus a great cafe on it’s westside. Satu loves going there for some prawn sandwich which it appears is always sold out, well each time I’ve tried to order it for her, as they never have any left by the afternoon. We discovered great pesto spaghetti there, of which the little one is a huge fan. Funny what she likes, straight up cod liver oil, waving the bottle in her direction is a sure fired way of getting her out of the shower, also olives are devoured in abundance!! I am not sure what all this means about her eating habits, updates to come. After a short break from the snow for some work, more of that later, I was back on the fjell by late January, and as you can see, am happy to be gliding down the tracks. In living at a resort, there is a ski bus, and in the morning I can get up lift to Pellestova on top of the fjell, and ski all the way to Lillehammer via he saddle of Nevefjell, and then get the local bus home, a 3 hour round trip, of which 22km is on skis. Over the winter, I found the fastest route, and tried to go twice a week or so. The quickest I managed was 82mins for 22km, but there is a lot of downhill in that, still great fun rolling through the winter wonderland at speed. All this by the way was a warm up for Sam and I to attempt the Birkebeiner trail, 54km from Rena in Norway’s east valley over 2 fjell to Lillehammer. On the day of reckoning, we took an early train from Lillehammer, via Hamar to Rena. In a local sports store we found out that the trail starts 3km out of town, but we could access the start, by walking to a local school, whose trails connect to the Birkebeiner, so that was another 4km. 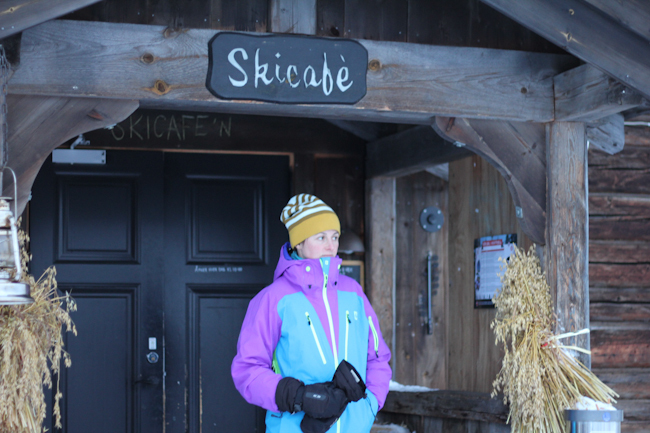 Eventually we started skiing, and the 18km near motorway sized trail going up the hill went on for 18km. On the long climb the snow conditions changed from blue to purple grip wax, and then back to blue again, so some re-waxing was needed. Once on top of the first fjell, we were battling a strong head wind, and heavy snow drifts on the track, clearly Sam commented we should of been coming from Lillehammer. We got to Kvarstad at the foot of the second fjell in 4 hours, which was less than half way, a lot slower than I thought we’d be. We fuelled up on brown cheese & jam, and climbed Midtfjell, from the top we could see Sjusjeon, and off we went, the pace quickened, as we knew from there it was pretty much all downhill to the Birkebeiner Stadium, the end of the race trail, but for us it was 2 more km to Lillehammer. We arrived into the stadium at sun down, I managed to capture Sam celebrating the finish line. 7 hours to do 60km, it was good fun, and now I know the demands of the trail, I am sure we can go faster, especially with no head wind to battle against. Note though the record time is 2 and half hours, that seams some what well beyind our reach, sub 5 hours may be…. This winter we had many visitors, and its great to bring them out on the trails, especially when its a multi-family outting, as it appears to be a lot these days. Trying to get non-skiers or alpine skiers to attempt nordic skiing can be fun, its more like hiking come joking, with the downhill parts more exciting. Often you need to help the little guests out with a drag tow, or even lift them off the deck for the downhills. Timing with a group of little ones is everything, trying to get the most out of the skiing, is best when it’s nap time for them. We aim to hit a cafe or waffle house en route or at the end of the trail, there are many great trails and waffles to be had on Øyerfjellet. Beyond the nordic ski tracks the tradition is fjellskiing, that is touring on the open mountains on often un-tracked although normally marked trails. We have had a few attempts at this. Firstly you really need fjell skis, these are wider than nordic skis and have metal edges, plus more supportive boots, for longer down hill runs. It’s a beginners style of telemark skiing for the downs and walking/gliding on the flats and hiking with skins on the ups. It’s certainly more of an adventure than the classic cross country skiing, off piste as such, but not at my level out of bounds. Fjell skiing is a corner stone of nordic winter life, with weekend’s away common place, especially from mid to late winter once conditions are stable and slighter warmer. Easter is probably the most popular time for such fun in the hills. After Christmas we tried to reach an over night mountain cabin pulling the little one in the pulk, but the lack of trail markers and low visibility meant we turned back. More recently we tried again, but strong northerly winds had other plans, so we enjoyed fun in the trees to avoid being batted about on the fjell. At Easter, no doubt we’ll head up again on to the fjell, I am hoping we can have some more stable conditions this time, please. Lastly, I did do some work in January, it was cold and dry. After the wettest December on records, drier times were always going to come. I see that the end of the UK’s paddling winter, has been a barren affair too. It’s always difficult to work consistently on the natural rivers of Devon, happily it’s normally warmer there than else where in the UK, and easy access in and out for me. In January, we had a lot of work, it’s been Gene17’s second busiest winter with 140+ paddlers on 2 day courses. Although these UK paddlers are increasingly less likely to venture on to our trips products due to economic conditions and the weakening of the pound, but hey, we get a lot of others from elsewhere, thankfully.